Over the counter whitening products can leave you very disappointed with not much change at all. 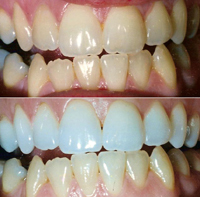 Dr. Arndt’s prescribed cosmetic whitening procedures will give you the whiter brighter smile you have been looking for. Your new incredible smile can be achieved quickly and inexpensively without bonding plastic or porcelain material to the teeth or removing sound tooth structure. We make for you custom fitted trays that are very comfortable to wear. You apply the whitening material at home, and in a matter of weeks you will have a whiter brighter smile that you are proud to show off.